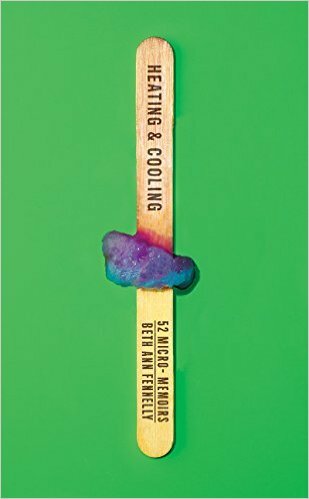 Ninth Letter is delighted to be able to spread the word about the publication of Heating & Cooling, Beth Ann Fennelly’s collection of 52 micro-memoirs. In recent years, a certain type of nonfiction has been intensifying itself like a fine sauce reduction, creating something elemental and yet complex. Flash nonfiction is practiced by an impressive list of writers like Eric LeMay, Rigoberto González, Jenny Boully, Barrie Jean Borich, Ira Sukrungruang, Robin Hemley and many others. James Richardson, in his collection Vectors, offers us—in addition to his aphorisms—“ten-second essays.” And Works, by Edouard Levé, is both micro and monumental: 533 succinct descriptions of artistic projects he was hoping to create but hadn’t yet gotten around to. And now Beth Ann Fennelly gifts us with Heating & Cooling, her wry and insightful micro-memoirs—some a few pages long, others a paragraph—that read like the type of revelations one hears from a new friend, that moment when the good stories come out: the defining, quirky, funny ones, the sad ones that demand a pause, and even those that, with a kind of verbal hands-up shrug, offer what’s strange and inexplicable. And afterwards, certain moments will remain and tug at you, turning something you thought you knew into something you still have to ponder: a siren, floss, solitary confinement, any bird’s now three-dimensional signature. I’m not at liberty to yell at my daughter for wedging a gummy bear in the bell of her trumpet when I’m the one who decided to fish it out with a chopstick. I’d moved to Arkansas, invited my sister to visit. She was still in Chicago, living with her boyfriend, in an implacable brown condo wedged between a Vietnamese church and a fire station. She was a social worker in Cabrini Green and tough. Tough. On Sunday mornings, she used to leave threatening notes under the wipers of any church-goers who dared to park in her spot. When she and her boyfriend visited, she had trouble falling asleep. Too goddamn quiet here. Over coffee the next morning she said that finally her boyfriend sang her to sleep, toggling the two notes of the siren in her ear. Mid-morning, mid-rainforest, we took a break. I sat on a log and the bird guide chose to squat, both of us peeling mangoes. We hadn’t spoken much since setting out from the lodge before dawn. He wasn’t the where-are-you-from, do you-like-my-country, gratuity-appreciated type. Fine by me. Better than fine. Instead, he’d sight, point, wait while I fumbled with my binoculars to loop the pair of spectacled owls or the blue-crowned mot mot in the cashew tree. He’d answer my questions, and then we’d tongue deeper into the green. A boy loved me so much that he reached across the bed to pluck one of my long red hairs. And flossed his teeth. When I lived in Brazil, I often dined in a restaurant with a tree-shaded courtyard. One night in November, which is to say, summer, my friend Julio appeared beside my table, tall lovely gay Julio with lashes long as a giraffe’s. He slid the black leather dessert menu out of my fingers. Look up, Betchy--that’s how they said my name in that country--Betchy, look up. I looked up into the jabucabeira tree, which I had frequently admired, and saw its trunk and limbs were studded with fruit. Heavy black fruit, scrotal, was growing right on the branches, which were drooping now just out of reach. And this is the part where Julio smiles. Calma, Betchy, calma. He pulls a branch down to where I sit in my embroidered skirt. Without having to shift in my chair, without even uncrossing my legs—it’s that easy—merely by raising my arm, I grasp a fruit and, like unscrewing a lightbulb, release it into my dominion. Friends materializing by my side. Ripe fruit dangling overhead. Unpremeditated bliss. Is it clear to you now, at last, and forever? That’s the type of assistance I need. The time I’ve spent planning for solitary confinement—the regimen of pushups and sonnets, meditation and memorization, to keep my mind from cracking—has become a kind of solitary confinement. Beth Ann Fennelly, Poet Laureate of Mississippi, teaches in the MFA Program at the University of Mississippi, where she was named Outstanding Teacher of the Year. She’s won grants and awards from the N.E.A., the United States Artists, a Pushcart, and a Fulbright to Brazil. Fennelly has published three poetry books: Open House, Tender Hooks, and Unmentionables, a book of nonfiction, Great with Child, and The Tilted World, a novel she co-authored with her husband, Tom Franklin. Her newest book is Heating & Cooling: 52 Micro-Memoirs (W.W. Norton, Oct. ’17) Fennelly and Franklin live in Oxford with their three children.